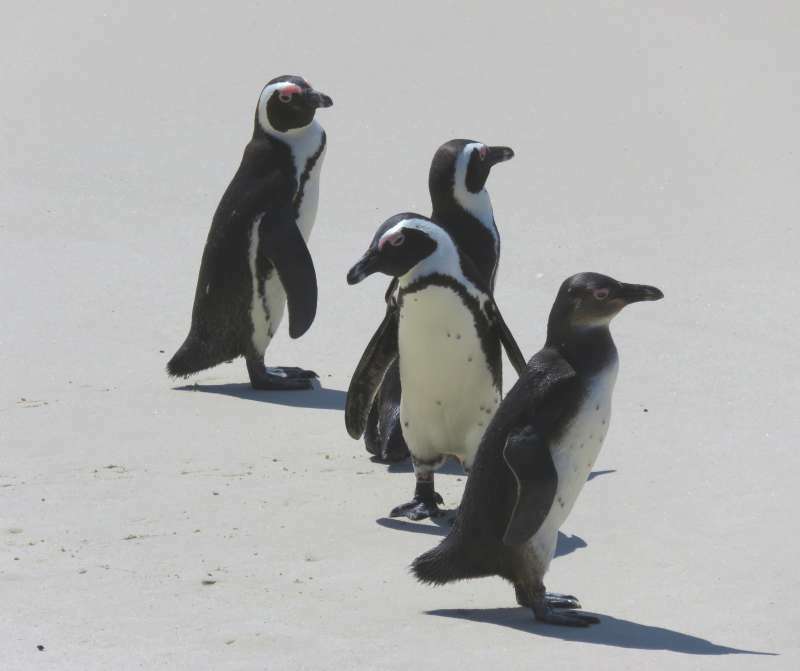 The Travelling Lindfields: Where can you see penguins in Sth Africa? 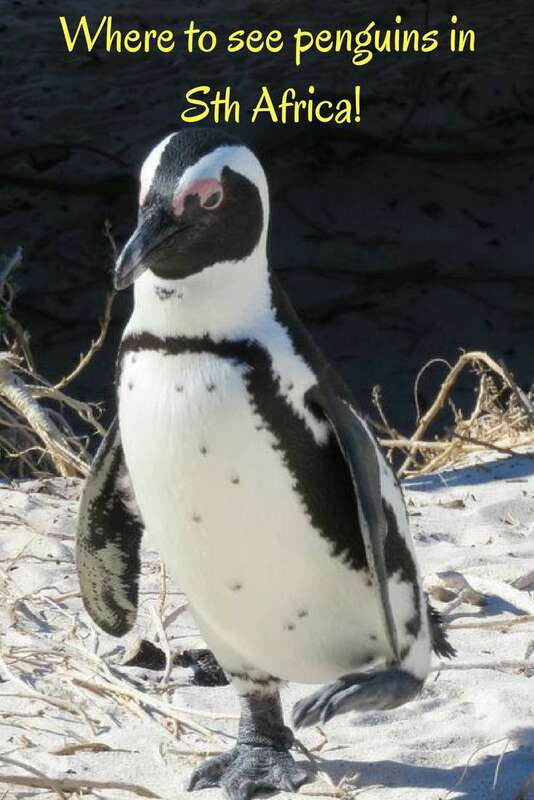 Where can you see penguins in Sth Africa? Penguins in Africa! It sounds like a contradiction in terms but there they were, on Boulders Beach, right where our guide book said they would be, dozens and dozens of African penguins. Also known as jackass penguins, because their call sounds a bit like a donkey, African penguins live along the south-western and southern coasts of Africa between Namibia and Port Elizabeth. If you want to see them and you are in Cape Town just head out to Boulders Beach, Simons Town, a mere 45 minutes by car. 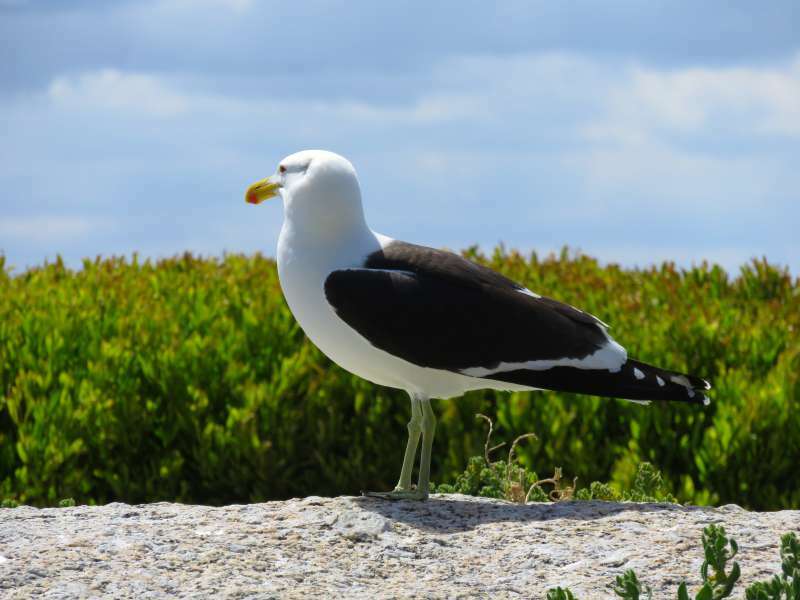 Combine your visit with a trip to the Cape of Good Hope for a great day excursion. Living in Australia, I am used to little (fairy) penguins, the world's smallest breed. Little penguins stand 30 cms (12 inches) tall and weigh 1 kg (2 lbs). They are very timid. Although there are some great spots to view them in southern Australia they stay out at sea or hide in their burrows until after dark. You are unlikely to see them during the day. At 60 cms (24 inches) tall and weighing up to 3.6 kg (8 lbs) African penguins are not so easily frightened. 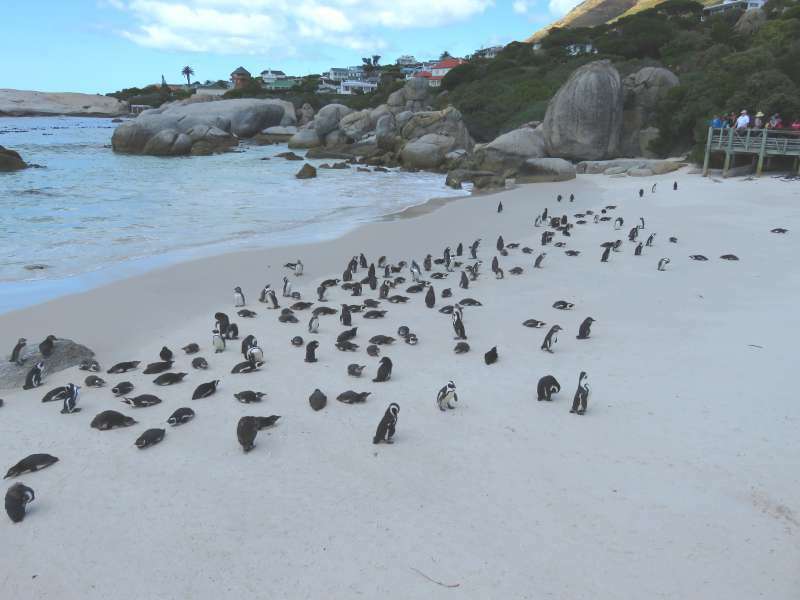 Those we saw at Boulders Beach were standing around in broad daylight, completely unconcerned about any daylight dangers. I took this photo on our first trip to Sth Africa in April 2016. The penguins were nesting. Can you see the chicks? I took this photo in October 2017. There were fewer penguins on the beach but still plenty to see. Boardwalks and viewing platforms take you right into the heart of the colony. Along the boardwalk you can be less than a metre from individual birds and, standing on the viewing platforms, only a couple of metres. The penguins walk right up to, and beneath, the boardwalks. Boulders Beach is at 6 Kleintuin Rd, Simon's Town. There are signs directing you to the car park from the main road, Queens Rd. Once you've parked your car just follow the people and you can't go wrong. There is a small entry fee (35R for adults, 10R for children). If you have a Cape Town Pass entry is included. When is the best time to see the penguins? The boardwalk is open between 8 am and 5 pm from April to September and between 8 am and 6.30 pm from October to March. The penguins are there all year round but during September and October they spend more time feeding at sea and less on the beach. Having said that, we visited Boulders Beach in October and there were plenty of birds to see. 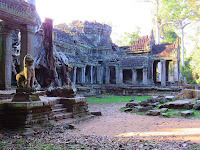 Check out my two photos above to get an idea of the difference in numbers. One photo was taken in April and the other in October. Not a penguin! This seagull looked so lovely against the background of grass and sky I had to include him. 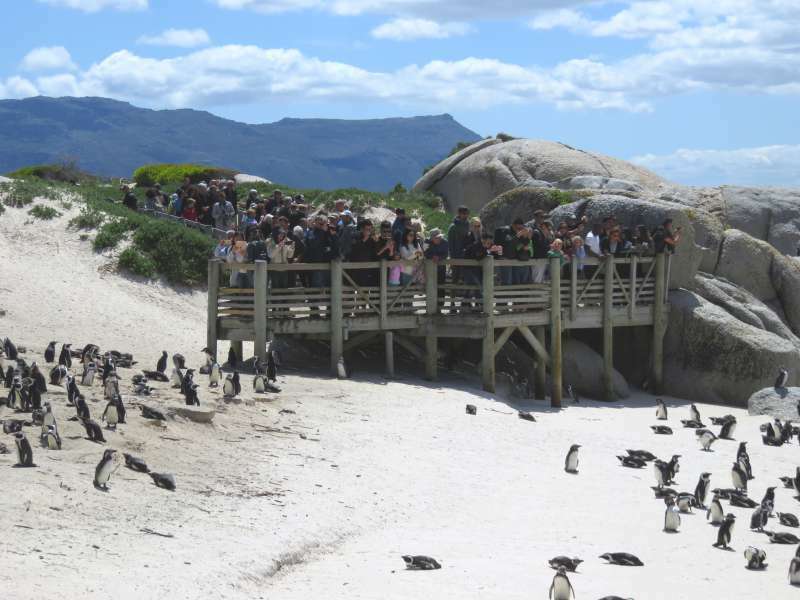 Is Boulders Beach penguin colony crowded? We visited Boulders Beach in April 2016 and in October 2017. There were lots of other people both times but it wasn't so crowded that we couldn't get a good view. There are two viewing platforms overlooking the beach. The far platform was less crowded but further from the penguins. To reach the far platform take the boardwalk entrance on your right just past the entrance turnstile. Even at the more crowded platform it didn't take more than a few minutes for those at the front to move on and make room for newcomers. The boardwalks leading to the beach go right through the colony so by the time you get to the beach you will have seen lots of penguins close up. The viewing platform looks a lot more crowded than it felt. If you are headed east from Cape Town toward Hermanus you'll get a second chance to see African penguins at Betty's Bay. Follow the R44 past False Bay and watch out for the penguin signs. We saw the signs but we didn't turn off. I had tripped over in Cape Town the day before and feeling a bit sore and sorry for myself, I didn't want to stop. 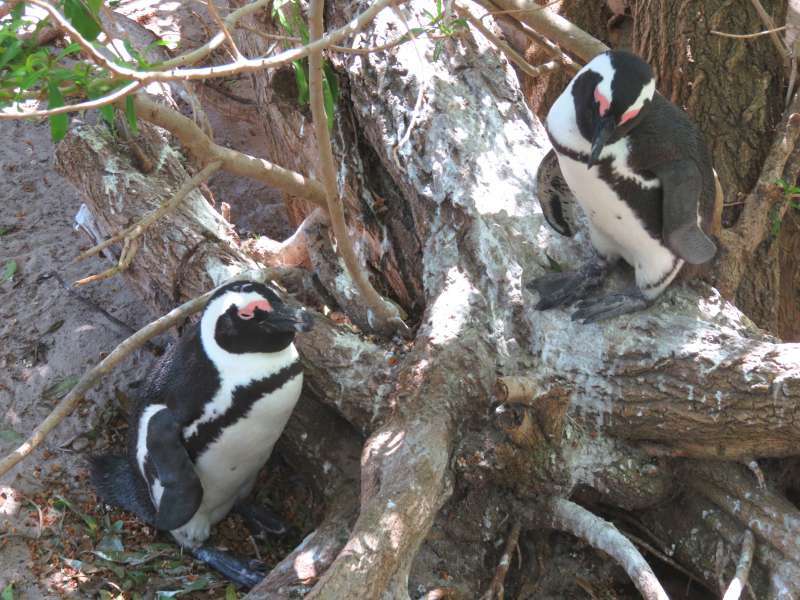 The Betty's Bay penguins are top of our list next time we visit the Western Cape. Little penguins. I put this photo in to tempt you to visit Australia and see the world's cutest penguins. Kirstenbosch: Is this the world's most beautiful botanic garden? I am a big fan of penguins so I'd definitely be keen to go and visit them. I also like the idea of the raised boardwalk, that way you can be sure nobody is disturbing the penguins. I've glimpsed the little penguins in Sydney before but am always worried about scaring them! There are so few little penguins in Sydney now that it is very rare to see them. You are lucky to have even caught a glimpse. Haha - I adore penguins. Poor David has been dragged around so many places in Australia and New Zealand so that I could catch a sight of them. That's sooooo cute. I don't think of S.Africa as a penguin place, but of course it is!! For some idiotic reason I thought Sth Africa was in the Northern Hemisphere and therefore entirely penguin free. It turns out though that Cape Town is on the same latitude as Sydney. Lyn our time at Boulder Beach was one of the high points of our time in South Africa. I loved seeing the wee penguins in Australia but to see the African penguins in the day time was a dream come true. They really do sound like donkeys don’t they? One day you will have to come back to Australia and see the penguins on Phillip Island, or better yet King Island, and then come and visit David and I and see the kangaroos which come into our garden each evening. You would love them. I only knew there were penguins in S. Africa because I have a friend who is a penguin lover and they framed there photos of the penguins from their visit there. I think it's just not something people think of in Africa. Great photos! For me Africa always conjured up images of elephants, giraffes and lions not penguins. It was fun seeing them partly because I didn't expect it until I started researching thing to do in Cape Town. Sadly there are very few, if any, penguins left on Kangaroo Island. The New Zealand fur seal population has boomed and just about wiped them out. The New Zealand fur seal is native to Australia so we can't blame the kiwis. There are lots of places to see them in southern Australian but Kangaroo Island is no longer one of them. David and I once saw penguins on King Island which was just fabulous. Ar! So many memories! I got to go to Boukders Beach in 2008 and loved it! I'm a big fan of penguins! So many people love penguins - you and I are in good company. Wow, that's a lot of penguins! I'm impressed that they are right out there in the daylight (I too am used to the fairy penguins that prefer to come ashore after nightfall). One of your photos has them almost lining up in neat rows. It was weird seeing penguins in the broad daylight - but oh so easy compared to staking out a beach at sunset. African penguins are much smaller than penguins in the Antarctic. Like you I would love to see them in Antarctica. 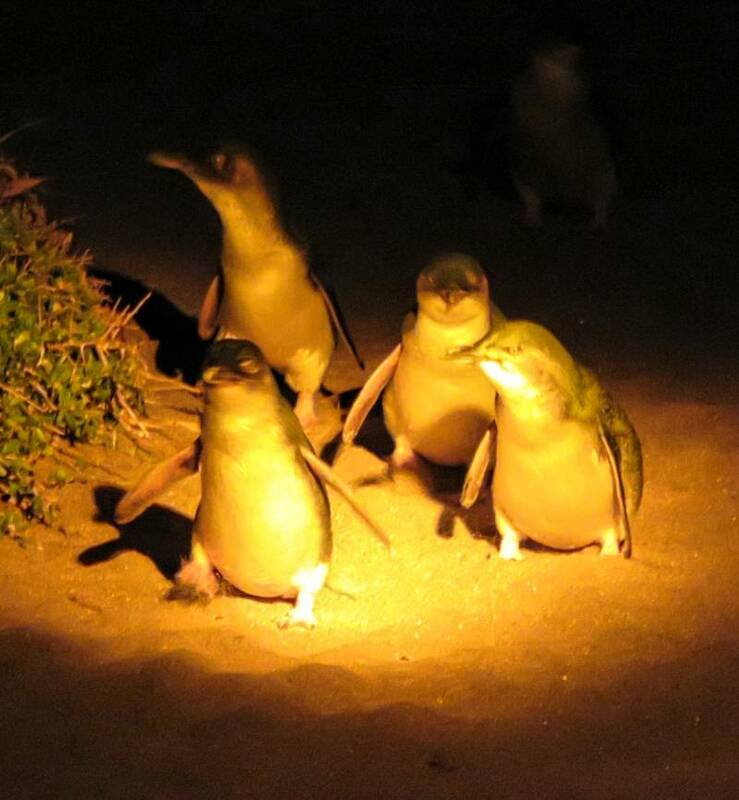 You are the second person to comment that they saw fairy penguins on Kangaroo Island many years ago. Sadly the colony has all but disappeared. It was decimated by increasing numbers of New Zealand fur seals (which are native to Australia). There are still some great places to see fairy penguins in southern Australia but Kangaroo Island is no longer one of them. You will love our Australian penguins. They are super cute. Let me know if you ever decide to make the trip down under and I will give you some pointers on where to go and what to do. I did not know you could see penguins in South Africa. Boulder Beach looks like a must-do for any South African itinerary. Penguins and Africa aren't something you would expect to go together. OMG I love the penguins...I've never seen them in the wild...so this would be a dream! And I love that you showed how crowded it is...realistic expectations are always good in my opinion. I'm adding this to my list asap! I hope you get there one day. I am sure you will love it. Living in the Southern Hemisphere I tend to take penguins a bit for granted and assume everyone has seen them in the wild at least once or twice. I forget they don't live in the Northern Hemisphere. They are so cute. I can't imagine going to Cape Town and not making the time to go to Boulder Beach. We don't have Penguins in Canada, so I have only ever seen them at the zoo (Singapore, I think). Penguins are only in the southern hemisphere in the same way that polar bears are only in the northern hemisphere. I would love to see a polar bear in the wild. I have read a bit about the Betty's Bay penguins. We drove straight past them but I wasn't well so we didn't stop. It is definitely something for our next visit. Would love to see the Penguins - around where we live Manly NSW there used to be a lot of fairy penguins, not sure what has happened to them. They have been attacked by dogs and there was an incident some years ago when hoons on jet-skis (before they were banned in the harbour) killed several of them. I believe there are only a very small number (2 or 3) left. It is such a shame. I remember seeing one once when I was visiting a friend who lived at Manly. I've heard about the jackass penguins of Cape Town. I hope to see them in person one day. I am sure you will love them as much as I did. Oh these are so adorable, Lyn! It's amazing that you can get so close to them. I'd love to see penguins in the wild. This is a really useful post for #FarawayFiles. Thank you. They have to be one of the cutest animals (birds) on the planet. You'll just have to plan a trip to Sth Africa! Look at all of those penguins! They seem to have an almost magical effect on people - similar to koalas and unicorns! ;) Would love to get to see these guys one day. Thanks for sharing with #TheWeeklyPostcard & #WeekendWanderlust. I can't say I have ever seen a unicorn. Now that would be something! Africa is about the last place I expected to see penguins - until we went there. I have seen these penguins in friend's and fellow bloggers' posts. It's one of the reasons we would love to go to South Africa and see them up close. They are so adorable and I like that you can see them up close and there are so many of them. Great perspective on the number with your contrasting photos. I din't realize they were called jackass penguins :) I would also love to see those little penguins in Australia now too. Penguins are adorable wherever you see them but I do think our Australian penguins are just a little bit more adorable. Penguins are so cute and I would love to see some soon, Lyn! I loved your post and breathtaking pictures! There are lots of places to see them in the southern hemisphere. I have a soft spot for our little penguins in Australia but you can't see them in broad daylight the way you can in Sth Africa.